If only because of the lessons provided by 30 years of pop cultural scrutiny, The Simpsons’ Esports episode, “E My Sports,” avoids most of the most obvious pitfalls such a storyline suggests. Leading up to the episode, the overlapping group of Simpsons fans and avid gamers were publicly assured that the show had enlisted the folks at Riot Games to ensure that Bart’s foray into the competitive gaming world didn’t creak with old guy jokes about those kids and their blipping and their beeping, and so forth. 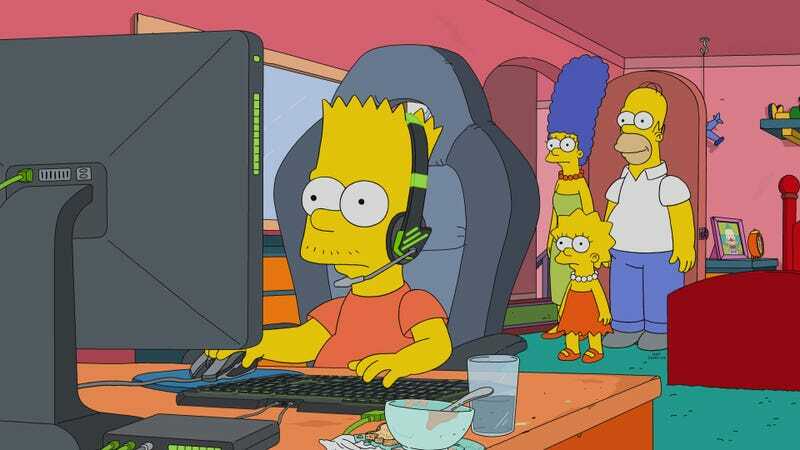 As Bart and his team, the cleverly named Evergreen Terrors (Nelson, Martin, Milhouse, and Sophie Krustofsky) blip and beep their way through to the $500,000 finals of their South Korea-hosted (fictional) Conflict Of Enemies tournament, their headsets call out with the appropriate cries of “noob,” “gg,” “ganking,” and other terms I no doubt missed because of being an old guy. In addition, the jokes aimed at the gaming community at large steer a wide, wide course away from any mention of the more odious and controversial incidents and figures in the sport in favor of a fair number of modestly pointed digs. Sophie excitedly claims a win would make her the most famous female Esports player in the world, adding, “Also if I lose!” Bart, having been bribed with a primo gaming setup by Homer in lieu of actual parenting, immediately grows a sullen little preteen mustache. And there’s a genuinely funny turn from an aging gaming tutor (he’s 19) calling himself The Detonator that goes beyond the “maladjusted gamer” cliché by allowing Homer’s hired gun to be comically self-aware. Voiced by Simpsons regular Chris Edgerly, The Detonator is maladjusted, sure. He silently hands Marge a note explaining that he can only respond game-related conversation, but he politely gives her a “Thank you, ma’am,” when Marge manages to slip some game-talk into her directions to where Bart and his gaming gang are. And when he—after showing off his lingo-laden expertise at both Conflict Of Enemies and not wasting precious moments washing up in the bathroom (he wipes his hands on Homer’s shirt on the way back)—realizes he’s lost his edge, he soberly (but sagely) burns his gaming accoutrement (including soul patch) and resignedly tells Homer that he can work in a relative’s tile store. “It’ll be a good life,” he sighs, “Good enough.” Godspeed, The Detonator. But apart from The Simpsons doing its homework, “E My Sports”’s Esports gimmick isn’t any different from the “Homer bonds with his kid(s) over a new pastime” storyline the show has mined in the past. Hockey, sports betting, lacrosse, miniature golf, pee-wee football—the rules, uniforms, and gags all change to suit, but the core of the story is a decidedly human one. Drawing on universal, all-American tropes about parental expectations, childhood ambitions, and the hyperbolic nature of competitive sport, the stories all hinge on how this new enthusiasm stretches, tests, and ultimately resets the parent-child bond. (Unless the game in question drives a ten-year-old boy to attempt suicide, in a catastrophically tone-deaf episode that shall not be named.) And for all the blips and bleeps and whatnot, “E My Sports” has its moments, too, even if it shorts out in the end. I’ve noted before that certain names on a latter-day Simpsons’ script will angle my expectations up a few degrees, and LaZebnik’s is one. (Caroline Omine, Michael Price, and Bill Odenkirk are a few others.) These are people who’ve shown a tendency to buck the aging series’ worst impulses and ground their episodes in recognizably human (and Simpsons-human, which is harder) behavior. “E My Sports” ditches the opening credits entirely, too, something that’s usually another indicator that the creative team has more invested in the story and characters than perhaps is usual these days. And while Lisa’s reaction to the Bart-Homer bonding is ambitious in its way, it also leads to one of those rushed and unsatisfying resolutions that no amount of stolen running time can rectify. There’s no one who loves Lisa Simpson as a character more than I do, and I appreciate how her pain at being, once more, shunted aside just because her misbehaving older sibling has found something to distract him from, say, causing a soft serve avalanche at the local all-you-can-eat buffet, is given room to breathe. Threatening to act up just like Bart so her parents will give a damn about her, she only rips out her homework’s bibliography because she notices it could use some work. (We hear her amending it with several ibids and an op. sit from the other room.) Once she hears about the South Korea trip Homer and Bart are embarking on, her ensuing freakout to Marge is handled by Yeardley Smith with as much restrained dignity as a heartbroken 8-year-old can muster, even if she can’t help but passive-aggressively assure her mom, “I don’t want you feeling totally appropriate guilt for what this family has done to me.” It’s not inaccurate to call Lisa’s jealousy a little selfish and immature, but it’s also true that she’s got a lifetime of points, too, the revelation that she’d been holding onto her own South Korean dream of a seemingly impossible trip to a monastery known for its Zen salt mandalas emerging to legitimize her anguish. Lisa Simpson rocking back and forth while crying, “I’m holding onto a thin rope here!,” and pleading, “Hear me, hear me! Dear God, hear me!” is, in Smith’s hands, terribly affecting. And yet, the eventual collision of the Lisa and Bart storylines—in the form of a blissed-out Homer’s sabotage of the Evergreen Terrors’ imminent victory—fails almost entirely. Lisa’s demonstration of the impermanence of material ambition through the necessarily impermanent nature of her parents’ individually impressive salt creations isn’t given the weight it needs to power Homer’s rash decision, never mind to pay off the larger storyline of her bond with her parents. (Perhaps the unfunny post-sabotage robot rampage set ot the theme from M*A*S*H* could have been repurposed here.) And Homer’s momentary enlightenment serves only to crush his son’s newfound success and enthusiasm, with no ensuing payoff for the Bart-Homer relationship. We see pariah Bart being pelted with in-flight snacks by his furious team for the 19-hour flight home, while Homer irritatedly tries to regain his temporary calm. “E My Sports” navigates around some obvious narrative and comedic traps and makes some promising character choices, but, ultimately, the episode sputters to a disappointing conclusion. 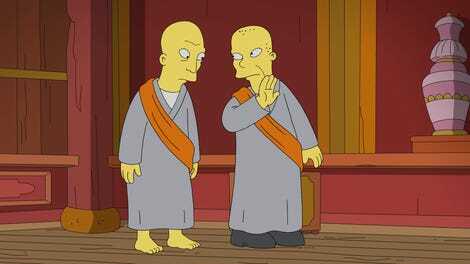 Ken Jeong pops up as one of the monks, stealing Homer’s shoes, while Natasha Lyonne comes back as Sophie.